Hurraw! 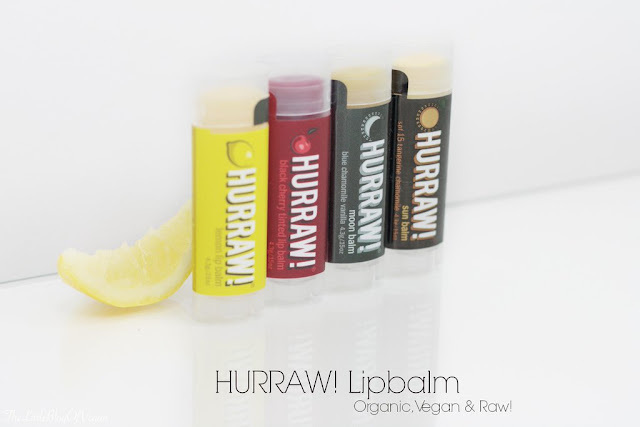 is an all Natural, Vegan, Cruelty-free company which make delightful Lipbalms which are cold pressed & made out of Organic, Fair trade and Premium Raw Ingredients. They are based in the glorious USA and are made fresh everyday!!! Each Product is carefully handmade with love, and each Balm is made to perfection. All of their products have been certified by the Vegan Org! Hurraw also make beneficial balms too! I was lucky to get my hands on a few of these enticing products! Before i get to the review, i wanted to mention about the packaging. I really like how youthful & colourful these products are! Most Vegan Lipbalms i have come across don't really catch my eye, unlike these. I have been enjoying the shape of the Balm, and the wearability & moisture benefits! Lets start off with the yummy Lemon & Black Cherry! The Balms are all shaped in an Oval shape which fits your lips perfectly without having to go over the parts you missed like an average circle shaped LipBalm. The Balm is incredibly Soft and creamy, and is intensely ,moisturising, as well as being very light, with a clear shiny gloss finish! There is an extra Lemony kick with a blend of Malagasy Lemongrass!!! I like how it has a strong succulent scent, without it being fake tasting/smelling. A perfect Balm for those hot sunny days! This Balm is extra special as it provides a light colour to your Lips, which i personally love for those days you don't want to wear a heavy Lipstick, but still want a healthy, red, tint. This is an easy colour to wear, and would suit any Skin tone, and the best part about it is you don't need a Mirror to apply it,as it not too red nor obvious. Moon Balm is delicious....emphasis on delicious! It smells and tastes like Vanilla Icecream! This Moon Balm is a night treatment as it contains a whole heap of great ingredients. These 4 Oils have great benefits for your beautiful Lips. Avacado Oil is high in Vitamin A & E,which is great for healing & for sensitive lips. Rosehip seed Oil has great Anti-aging properties. Argan Oil is great for restoring your lips natural moisture and speeds up healing. This Balm goes on clear, so no worries waking up and it be smudged all over your face. Your lips definitely feel plump and full of moisture & hydrated. Brush your teeth and pop some on before bed, and heal you little lips in your sleep...zzZZZ. Sun Balm also has some great Ingredients. I doubt you ever think of your Lips when out in the hot, summer Sun! Most Lipsticks & Lipbalms feel cooling & moisturising, but infact have no real protection against the Suns rays. This Lipbalm is an SPF 15. Skin will normally burn after 15 minutes in the bright Sun, but applying an SPF would allow you to stay in the Sun for a longer period of time( it allows you to stay in the Sun for approximately 150 minutes(15 times longer) Who wouldn't want that?!! This does depend on how much is applied! Lips are sensitive and are really important, so its worth taking precautions when on Holiday or out all day in the Sun. Red Raspberry seed Oil contains Anti-inflamatory properties. Sea Buckthorn Oil is high in essential fatty acids, carotenes, tocopherols, and phytosterols which are great for healing sun-damaged/dried lips. Pomegranate seed Oil is excellent in penetrating and as antioxidant properties which are great for the outer layer of your lips. It goes on virtually clear and silky smooth, so you can reapply whenever & wherever, without worrying about those annoying smudges! At a great, affordable price, there is nothing not to LOVE! Its a real joy to look through HURRAWS! website, as it is easy to navigate through pages, and the style & pictures make the website look beautiful. I could honestly spend ages looking through their delightful products! I used to have Moon Balm and it is such a lovely scent and incredibly smooth too!